Senior yoga classes are becoming more popular around the U.S. That's because regular yoga practice offers a number of benefits, including less strain on joints, increased circulation, reduced inflammation, and better overall sense of wellbeing. In this LoveToKnow Seniors interview, we talk with John Schlorholtz, the lead yoga instructor at the Harvard University Center for Wellness. 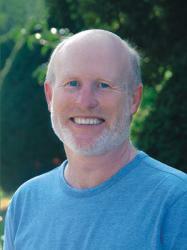 He's developed a yoga DVD series called Ageless Yoga. His routines are accessible to anyone new to yoga or with mobility issues. He incorporates the use of props, such as chairs, straps, and blankets. How old were you when you realized that teaching yoga would be a vocation for you? I was 28 or 29 when I gradually made the transition to becoming a full-time yoga teacher. What difference has it made in your life? While thinking of this question, a friend of mine has often quoted Joseph Campbell to me: "If you follow your bliss, doors will open that wouldn't open for anyone else and doors will open that you never even knew existed." One of the doors that opened for me that I never knew existed is the door to the world of teaching seniors. And walking through that doorway 20 years ago started a process that enriched and expanded my experience of humanity in ways I never would have anticipated. Right from the beginning, teaching seniors has been a cornerstone of my work, and I am definitely a far better person as a result. In general, also, being a yoga teacher has been wonderful and enriching. It has given me a fairly free reign to integrate and express most of my greatly varied predilections and interests, including spirituality, philosophy, working with my body, poetry, meditation, science and learning about the natural world, as well as an inclination to be of service and to be a healer. It has also allowed me to fulfill my mother's wishes for me in a manner that I'm sure gives the Universal One a good laugh. Mom, a Presbyterian missionary, always wanted me to be either a doctor or a minister, and, although she was very, very slow to warm to my choice of profession, yoga teaching has allowed me to combine in a modest way the roles of both doctor and minister. What benefits do older people experience with regular yoga practice? The following review posted on Amazon.com regarding one of my DVDs says a lot about this topic: "I got this DVD for my Mother who is a 77-year-old lung cancer survivor and who had to have a hip replacement a few years ago. My hope was that the DVD might get her moving a little, but in fact the DVD has become a guiding force in her life! She has gone from having an almost entirely sedentary lifestyle to practicing yoga with this DVD at least five times a week, and I have seen enormous improvements in her sense of balance, strength and level of energy." Senior yoga practice that focuses on the whole body can offer a lot of benefits, both physical and non-physical. Since yoga usually includes breath work and relaxation and meditation in addition to physical exercises, it is often effective in reducing the effects of stress. It also is a powerful system to increase one's awareness of one's body. Greater body awareness is extremely helpful in avoiding injuries and, along with the resilience that yoga fosters in the body, is useful in avoiding falls and in avoiding serious bodily harm if one does fall. Regular practice of yoga can help with flexibility, but it also helps with strength, joint mobility, balance, being centered, breathing, and in general offers an integrated approach to working with one's body and psyche. If one part of the body is injured or immobilized, yoga can keep the rest of the body mobile and active, thereby promoting health. Aside from all of these benefits, regularly doing yoga just plain makes people feel good. And when people feel good, they tend to have a better attitude towards life and be healthier. 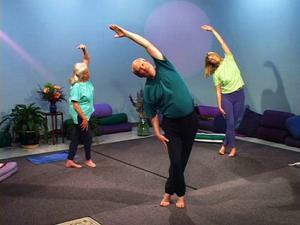 How is your program, Ageless Yoga, helpful to people over 55? In Ageless Yoga, I put particular emphasis on making sure every major joint in the body is used safely but thoroughly. I also employ rhythmic movement, which I think is usually more effective and safer than static poses for people who are stiff, prone to injury, or have illnesses and conditions like arthritis, MS, and Parkinson's. A man with Parkinson's who has been using one of my DVDs for about a year shared a great quote with me that he heard regarding this approach to exercise from one of his doctors: "If a waterfall stops moving in winter, it freezes up." I have tried to create a system that is inclusive and accessible so that people of almost any size, shape, and condition can participate. I also try to keep Ageless Yoga light-hearted and natural so that people can feel at ease, relaxed, and free to be themselves. From my point of view one of the main goals of yoga is to be happy and at ease in one's body and self. 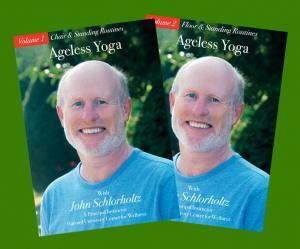 As an aid to people who want to do yoga at home and for communities or centers that that don't have access to a yoga teacher, I published two Ageless Yoga DVDs. "Chair and Standing Routines" is designed for people who can't get down on the ground. "Floor and Standing Routines" is designed for people who are able to get down on the ground and do floor work. Each DVD contains two hours of material and should never get tiresome. What do your older students say about practicing yoga? Some of my older students claim that their life spans have been increased due to yoga, but that is difficult to prove! One of my students had her 100th birthday recently. She started yoga at the youthful age of 82, and I would love to take credit for her longevity. I can safely say that she has given me credit for helping with her general enjoyment of life. One student commented, "I had stopped going to my local yoga studio because it seemed that suddenly we had this terribly young staff of teachers and they were all into handstands and headstands. I'm 60 years old; I'm just not into handstands! I wanted a gentle but thorough approach with emphasis on stretching and staying limber. And that's what you delivered." Most of "my seniors" say that yoga gives them a greater sense of well being. Some have reported that they fall less often, and many report that, when they fall, they feel they escape serious injury due to the yoga classes. Numerous older students think that doing yoga has helped greatly in recovering from medical procedures and surgeries like hip and knee replacements. Occasionally, the classes remove a pain quickly, as in the example of a woman who strained her leg badly when she tripped a couple of months ago. At the beginning of one of the classes she was very uncomfortable; at the end of the class almost all of the discomfort was gone. One area in which people have often felt helped by Ageless Yoga is in an area I had never considered: the loss of a loved one. One of my students gave my videos to a woman whose husband was gravely ill and was almost surely dying. The woman did the routines every day and considered them an important support at an extremely difficult time. Fortunately, the husband survived. A number of students have reported counting on the yoga to help them through times of loss. How does yoga for seniors help us change? I try not to focus very much on providing quick fixes to difficulties. Instead, I focus on providing a system that can gradually infuse participants with new, healthier approaches to their bodies and psyches. Most fundamental change is incremental and almost imperceptible to the majority of people. A former student in her 30s students illustrates this point. All her life she had experienced involuntary head movements from neck muscle spasms due to cerebral palsy. Over a period of about a year of doing yoga, the spasms gradually lessened and then ceased entirely, but, until I mentioned it to her, she didn't notice the change. It's remarkable how we can acclimate to different states of being without being conscious of it. Are there some people who never considered senior yoga before, and now, can't imagine their lives without it?Certainly there are people who initially came to my classes hesitantly and who now look forward to the classes as a high point of their week. I definitely hear complaints when I go out of town for any length of time because people miss attending the class. And there are other people who never thought to do yoga but who, as in the review above by the son who gave his mother a yoga DVD, gradually find that the rhythm of a steady home yoga practice is a great support in their lives. Although yoga isn't considered to be as strange as it used to be, people still tend to think its main activities consist of sitting cross-legged while intoning "om" and getting into impossibly contorted positions. People still tell me that they're too stiff to do yoga, which baffles me. Being stiff is a good reason to take up an appropriate, safe style of yoga, not to avoid yoga. What is the key message you want our readers to remember about seniors practicing yoga? Stay active! It's always possible to do some kind of healthy exercise or action, even if it's just deep breathing or relaxation techniques. And if one part of your body becomes disabled, don't stop using the rest of your body. I would especially recommend that you not approach yoga as a "quick fix" but as something to enjoy and appreciate as a process. Trust that, over time, with this attitude you will receive benefits and gradually "soak in" healthy habits of thought and action. Visit the Ageless Yoga website to learn how a senior yoga practice may help you. Read this new study about how yoga improves balance and may prevent falls. Review this article about how yoga may improve back pain better than other forms of exercise. Visit LoveToKnow Yoga for more information on various yoga styles, DVDs, and books.